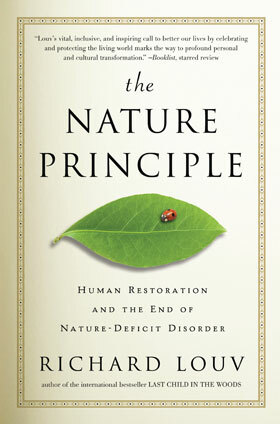 Honestly, I wasn't sure how to label The Nature Principle : Human Restoration and the End of Nature-Deficit Disorder. It is a memoir of one man's personal feelings about being outside? Is it an adventure book, encouraging you to step outside and take one? Is it fantasy? Relevant to history? I finally decided to label this one as being a book about "social issues." I think it's that more than anything else. I really am not a big fan of writing books simply to ask questions. There is something that seems dangerously wrong to me in that, mostly because we live in a time when society thinks it good to question everything. You have questions, I have questions and so does the neighbor next door and three doors down. Instead of spending time finding solid answers to our questions, we have this extremely bad habit of just asking them for the sake of asking them! We're like three year olds who never grow up and stop asking, "Why?" as if life cannot begin until we're mentally satisfied by the authorities around us bashing their brains out trying to satisfy our lofty superiority complexes which tell us we "need" to know everything there is to know. NOW. (I have no idea where I came up with that example. Thin air!) Instead of facts and principles to live by, we just walk around dazed and confused spending way too much time asking, asking, asking. Life is not a huge question mark and I resent people who go around telling the masses that it is. It only adds to our present dilemma of having teenagers who never grow up because they don't know what it is that they want to do and adults who can't seem to formulate a cohesive set of beliefs, convictions and morals. So I appreciate him stating up front that this book is basically a question (in the ever increasing line of questions.) That helped me to keep reading it, knowing that nothing conclusive was going to be stated. And nothing really was. This book is full of personal stories strung together to help argue the point Louv isn't making (in exact terms) that we need to spend time outdoors. There are feel-good stories that make you want to take the roof off your house so that your family is exposed to the outdoors at all times and in all kinds of weather. You can almost feel incomplete at times when pressed as to whether or not you have ever personally been chased down by a bear. I wasn't sure if I was supposed to admit that the deer that wander through our yard don't exactly scare me. At the same time, he shared a story about a guy who was attacked by a buck and now I'm wondering if I should ever let my children play outside with deer in the vicinity. I jest. Sort of. See? An example of being emotionally persuaded to do something without scientific fact applied. This book is full of such examples. I agree with his theory, generally speaking. I miss the days I've never lived in which people worked their own land, ate foods that were in season and played with pig bladders while recognizing the dangers of running into a bear in the woods and the need for a good guard dog. (I simply do not appreciate dogs the way I'm sure I should.) A friend suggested her personal theory to me the other day in which she said that she reckoned people had less time to fight with one another "back in the day" because they were just plain too busy. When they had a chance to get together and enjoy fellowship - they probably really enjoyed it! That's an interesting idea to think on. As are the ideas in this book. I think, generally speaking, you'd be hard pressed to find a person who didn't like nature (unless they have massive allergies and it's allergy season.) Mostly I think what Louv is hoping to do is to convince us not to forget about the outdoors in this fast-paced world. He is encouraging a slowness to life and would like his readers to make time to "get away from the noise" and take a walk in their local habitats to see what things grow and how beautiful life outdoors really can be. I agree with that. (I have to. God created the world and said it was good. This is what I believe and therefore I think it a generally good idea to get to know the world He created.) I just think Louv's arguments favor emotionalism and so I hesitate in being really enthusiastic about them. I wouldn't change my life based on this book, but it did provide some interesting food for thought. Ok, I'm pretty sure I've spent enough time talking and typing. I'm now going to go out and run ten miles and see how many birds I can spot while I'm doing so. With any luck, the neighbor's cat will see me as a violent threat and will attack me viciously, allowing me the opportunity to hone my nature skills! Just kidding. About the cat. Despite what it may sound like, I'm really glad that Algonquin shot a copy of this book my way. The opinions expressed above are entirely my own, as always. 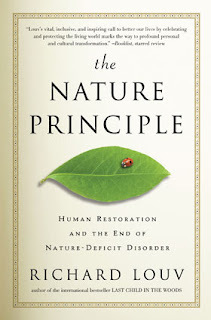 "I think, generally speaking, you'd be hard pressed to find a person who didn't like nature." Agreed! This sounds like a book that might bug me. One of the joys of the past year or so has been our nature study work, but the idea of analyzing the experience or reading an "argument" for it isn't real appealing for some reason. And I think I feel the way you do about books that merely question. Thanks for the review. I was looking forward to hearing your thoughts on this one! Sounds like most people will be content with just reading your review of the book rather than the book itself, since the book doesn't provide the answer! Thanks for the insights. I'm going to be my usual contrarian self and disagree with, "Generally speaking, you'd be hard pressed to find a person who didn't like nature." In your neck of the woods, that is probably true. I grew up in the big city, and about 90% of the neighbors my age had never been outside of the city, except in a car driving to another city. In case you missed it, a recent survey revealed that about 1 in 4 Americans have never visited a National Park. Ever. The same survey showed that more than 1/3 of parents prefer to spend time indoors. If you look at children in the lower 1/3 of the socio-economic ladder, or minorities whatever income level, these numbers are even worse. Some of us are continuing the tradition, but it is being lost completely elsewhere. Good review - you highlight the same issues I find with many modern books on "social issues". Well, @Diary of A, who would you BE exactly without that contrarian nature?! You and I both know of one female who once declared, "I do not do nature!" (Now, I was behind her on a trail when she almost inadvertently stepped on a slug and made this very loud statement. I completely understood her sentiments at the time. She was also wearing flip-flops.) Turns out she DOES like being outdoors though. She just likes being outdoors in the city. She likes pavement and bicycles. But she likes the fresh air. I think people DO generally like a chance to breathe in fresh air and given Louv's arguments about where nature can be found and how it can be enjoyed, I still think you'd be hard pressed to find a person who declared they didn't like it if they were introduced to it. I really like your answer in the comments about how we define being out in nature. I live in the suburbs. By Rhode Island standards we have a great sized back yard. By standards in other parts of the country it's tiny. We also live at the end of an airport runway. At times my house shakes when a plane takes off. I share all that so you know we are NOT rural. But we have 1 Oak tree and a bunch of bushes in our backyard. With the help of several birdfeeders we've observed cardinals, bluejays, finches, sparrow, tufted titmouses,mourning doves and several others. We've seen skunks, wild turkeys!, and tons of squirrels in our yard. We've watched a cat (not ours) stalk birds and squirrels. Then there are the earthworms, inchworms, fuzzy caterpillars, and beetles. All in our own backyard. One doesn't have to visit a Natl. Park (although we've done that too) to interact with nature. So glad to find your blog again. giggle I just love it when you are in one of these moods. The book doesn't sound the least bit interesting to me, but your review was highly enjoyable. Just a random comment, but I wonder if the reason books nowadays tend to raise more questions than answers is that we have reduced truth to facts, figures, and the results of double-blind studies. When you get out into the 90% of life, the universe and everything that can't be reduced to numbers, and you're not allowed to use wisdom, philosophy, or insight, then all you're left with is questions. I've always been very much an indoor person. Even as a child, my mom often had to "make" me go outside. I do have allergies, I like climate control, and I can sunburn in mere minutes (and sometimes I get itchy after being in the sun -- I don't know what that means). But even before allergies and sun sensitivity -- I just preferred the indoors.